In Denmark it’s kind of a tradition, or at least pretty normal, to serve boiled potatoes as a side dish when you serve meat for dinner. In general we Danes eat a lot of potatoes and especially the white and boiled ones. Potatoes are relatively cheap, filling and they do contain some good nutritions, however they do also contain many carbs. We do not consider ourselves any kind of health fanatics but we do try to cut away most of the less good food, with many carbs and fat, and replace it with protein and salads. 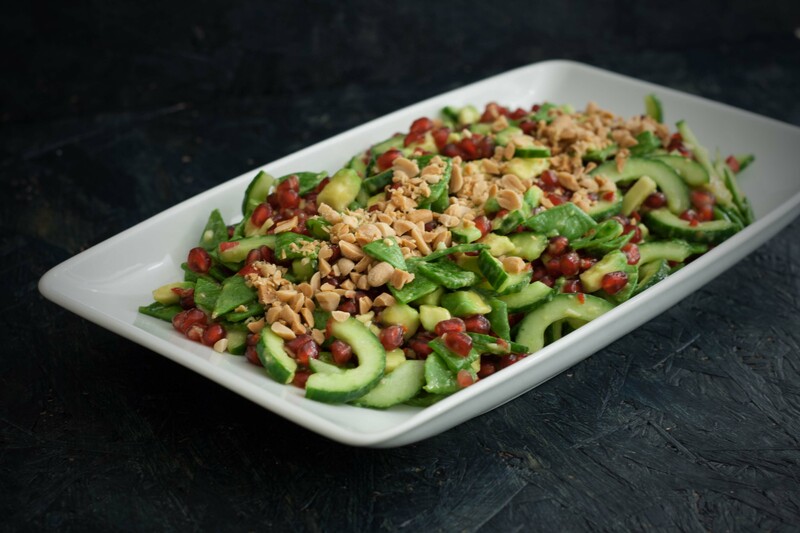 This spicy salad with avocado, pomegranate and sugar snaps is really easy to make and it’s perfect as a side dish for most meat. Normally we don’t use dressing on our salads, and we certainly never use any of the processed thousand island dressing or ranch dressing that you can buy at the grocery store. 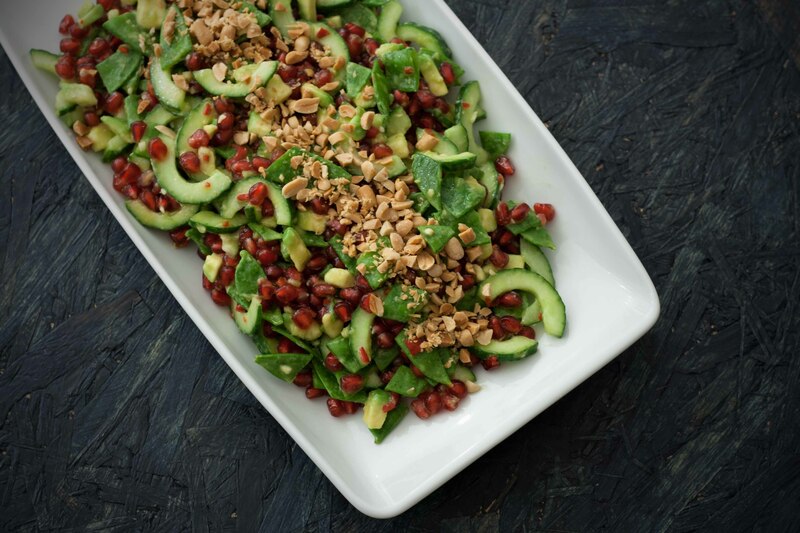 We believe that pouring these dressings on top of a nice salad, with fresh and delicious ingredients like avocado and pomegranate, would be a shame. We normally eat our salads as they are or sometimes with some quality olive oil. In this recipe we have made a spicy dressing based on olive oil and chili and added a couple of other great ingredients – it’s really delicious. 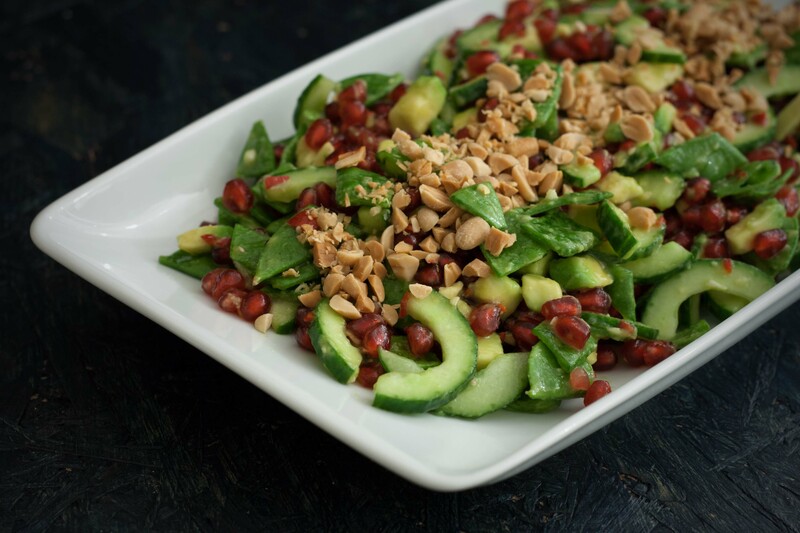 In this salad you are going to add pomegranate. Sometimes it can be kind of difficult and messy to remove the seeds from the fruit, however, we have made a simple and easy step-by-step guide how to seed a pomegranate the easy way and without the mess. Step 1: Rinse the sugar snaps and cut them in smaller bits. Step 2: Halve the cucumber lengthwise and use a teaspoon to scrape out the inner core/seeds. Slice it into half-circles. Step 3: Dice the avocado. We have made a simple guide how to dice an avocado the easy way. Step 4: Remove the seeds from the pomegranate. This can sometimes be difficult and messy so we have also made a simple step-by-step guide how to remove the seeds from a pomegranate in a smart way. Step 5: Coarsely chop the peanuts. Step 6: Mix all the prepared ingredients together in a nice salad bowl or plate. Step 7: Halve the chili and scrape out the seeds. Finely chop the chili. Step 8: Finely grate the ginger. Step 9: Press the garlic cloves in a garlic press or finely chop it. Step 10: Mix the chili, ginger and garlic with the olive oil, lime juice and honey. Season with salt. Mix it well together. Step 11: Pour the dressing over the salad and gently mix it all together. Serve right away.